SWAT is all about promoting smokefree lifestyles in the Sunshine State. Being in SWAT gives you the chance to make a difference in your community, while also being part of a statewide movement. SWAT is by youth and for youth to create a smokefree Florida through activism. SWAT members fight for these goals by leading projects. As a member, you decide how to fight and how to use activism to cause social change in a fun and cool way! The coolest part is, SWAT gives you real world experience: community service hours, college app building opportunities and hands on experince in leadership, activism, and promotions. In Clombia County, we will be expanding the reach of our SWAT Clubs in local schools. The SWAT Program is manged by our local Tobacco Prevention Specialist, Joseph O'Hern. For information contact Joseph at JOhern@QuitDoc.com. Secondhand Smoke: Who is at Risk in Columbia County? About 10% of all tobacco-related deaths occur as a result of secondhand smoke exposure. Middle school and high school students in DeSoto County report being exposed to secondhand smoke at rates significantly higher than the Florida average. This presentation looks at the risks associated with secondhand smoke, and the impact of clean air legislation on reducing secondhand smokes exposure. Recent surveys reveal that one-third to one-half of all teenage smokers made the decision to use tobacco because it "looked cool in a movie". Most tobacco use in functions subliminally by normalizing tobacco use. Since 1990, there has been a dramatic increase in the amount of smoking in movies, especially PG-13 movies marketed to middle-school students. The SmokeScreeners program teaches media literacy skills designed to reduce the influence of movie smoking. 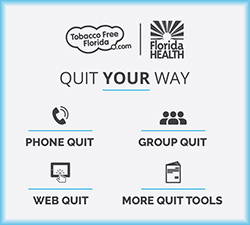 The Tobacco Industry currently spends $13 Billion each year to market their products in the United States; of that nearly $1 Billion is spent in Florida alone. That $13 Billion dollars breaks down to roughly $10,000 dollars spent on every new youth smoker recruited each year. 85% of that marketing budget is spent on Point-of-Purchase marketing... the advertisments, price-breaks, and give-aways that you see every day in your local tobacco retailers. Most of this is found in convenience stores in your neighborhoods. The Store Alert program teaches young people to be aware of the types of marketing gimmicks used by the Tobacco Industry in local stores. An additional prorgam is available to train youth on a system to conduct surveillance in the community and report the results as part of a database maintained by the Campaign for Tobacco Free Kids. After the Master Settlement Agreement of 1998, which resolved a series of lawsuits between the States and the Tobacco Industry, the industry agreed to a number of new marketing restrictions, including reduced magazine advertising, and the elimnation of cartoon characters from all ads. The Tobacco Industry then exploited every loophole in the agreement, including the marketing of new candy-flavored tobacco products to entice youth. While the new Food and Drug Administration rules regulating tobacco products has banned flavored cigarettes, tobacco manufacturers continue to exploit loopholes in the FDA legislation, including newer kid-friendly smokeless products and flavored cigars... neither of which is currently regulated by the FDA! The Strange Candy program discusses issues of tobacco marketing with a focus on the issue of flavored tobacco products. Most of these presentations can also be tailored to an adult audience, such as a PTA. If you are interested in scheduling a program, please contact Joseph O'Hern by email at JOhern@QuitDoc.com. All programs are free-of-charge within Columbia County.